On November 15, Congress passed Bill No. 17-192 appropriating a sum of $5,697,383.00 ($5.7 million) from the General Fund of the Federated States of Micronesia to fund Congressional public projects at the four States and provide for Federal Emergency Management Agency (FEMA) payments owed by the State Governments. This bill, which became Public Law No. 17-67, was vetoed on November 22 and overridden on November 24. The FEMA payment sections for Chuuk and Yap contained languages for repayments to the FSM Government, for Chuuk and to certain Congressional projects, for Yap. For Kosrae and Pohnpei, the legislation did not specify any repayment obligation to the FSM Government or otherwise. On the public project side, an amount of $4.2 million was appropriated and divided equally amongst the fourteen Congress Members. This would make available $300,000 for each Member to fund various projects and activities itemized through sections 2, 3, 4, and 5. Equal apportionment per Member in public project appropriations has been the status quo for some time in spite of occasional protests by Members based on population demographics and Congressional terms. After reviewing the Act, the President asked Congress in his veto message on November 12, 2012, that the national government pool the FEMA reimbursement funds from all the allottees in order for the President to reimburse FEMA in a lump sum, rather than create a four-way split with different allottees among the states. “Mixing FEMA reimbursement with public projects allocations creates confusion. The FEMA reimbursement – being an extension of the terms and conditions of US federal grants – constitutes a different subject matter than local projects, which is why I submitted a request on FEMA separately from any other supplemental budget”, the veto message stated. “… I recommend that the national government pool all FEMA reimbursement funds from the allottees as soon as possible in order for the President to reimburse FEMA in a lump sum. A lump sum payment will avoid duplication of work and ensure consistency in dealing with possible issues surrounding the reimbursement”, the President further stated. As for the rest of the legislation, fourteen line items for various projects and activities were vetoed, which would reduce the $4.2 million project appropriation by $149,600. In clarifying the basis for the vetoes, the President stressed his opposition of “public expenditures that have little or no lasting impact on the economy” and reiterated the need to link projects to the Nation’s Strategic Development Plan. “The national agencies implementing public projects, and the States benefiting from them, must formulate projects together. For the sake of transparency and the involvement of the public whom we serve, public hearings and open consultations are important”. How could effective planning of projects that worth millions be achieved in a short period of time without the benefit of review and input by intended government official implementers and beneficiaries in various communities and organizations? Could there be a better system with regards public project appropriations to ensure they nail the bull’s eye in bettering communities, improving lives and growing a sustainable economy? The President said, “I urge Congress to develop clear standards for public projects and social programs, tied to the Nation’s Strategic Development Plan, with public hearings required to promote transparency”. On November 24th (Saturday), two days before adjournment of its 4th Special Session, Congress overrode the President’s veto after the Congressional Standing Committee on Ways and Means gave its recommendations to the plenary on Friday through Standing Committee Report (SCR) No. 17-165. Your Committee finds the vetoes to be grounded solely in policy. To justify vetoes of the FEMA payments, the President alleges that certain items raise ambiguities and may be unconstitutional on equal protection grounds. Your Committee finds this argument unconvincing. Why do Yap and Chuuk have to reimburse their FEMA payments while Kosrae and Pohnpei do not? As for the fourteen items that were vetoed, the committee report stated that in the Ways and Means Committee’s view, the vetoed items were “consistent with sound public policy”. The committee disagreed with the President’s view that many of the projects did not have strong linkage to the Nation’s Strategic Development Plan and might have “little or no lasting impact on the economy”. However, one cannot clearly figure out what “sound public policy” guided the committee’s views and gave Congress the confidence in the vitality of the override. In short, overriding the President’s vetoes means each Congress Member now has $300,000 to expend until September 30, 2014. And, the FEMA reimbursements on behalf of the states are available out of the general funds of the national government, through the allocations to Congress’ public projects and social programs. The overridden public law has become Public Law No. 17-68. After being briefed by the FSM Peer Review Team on its activities at the states of Kosrae, Yap, Chuuk and Pohnpei, President Mori took time to sit down with the media section of the Peer Review Team for a video interview. The photo above shows the President (left) and Mr. Johnson Honimae, Media Officer of the Forum Secretariat, at one point during the interview held at the President's Conference Room the afternoon of November 26. Following the interview with the President, the Peer Review Team crew also held a similar session with Ms. Evelyn Adolph, Director of the Office of Statistics, Budget and Economic Management, Overseas Development Assistance, and Compact Management (SBOC). According to Mr. Honimae, the interviews will be compiled and produced by the Forum Secretariat in a ten-minute video production on the review process with the FSM and displayed at the Pacific Islands Forum Meeting of Leaders in 2013. Parts of that video production on FSM will be also used in a region-wide production on Peer Review processes involving other Pacific countries. Post Master General, Mrs. Ginger Porder Mida, giving a welcome remarks to a sizable group who attended the dedication ceremony of the new FSM Postal Service Office sub-station at the Pohnpei International Airport. Official release on the event is about to be released, pending review from the FSM Postal Service Office. The FSM Peer Review Team briefed President Mori on November 26 after visiting Kosrae, Yap and Chuuk last week as part of their work for the FSM Government. The past two weeks, the team has been conducting meetings with government officials, business sector members, NGO's and others to review the national planning, budgeting, public financial and aid management processes in line with the Pacific Forum Compact for Forum member-countries. At the briefing, the team made some general observations on their completed state visits and informed the FSM that a write up of its findings and recommendations will be presented in about six weeks time for review and comments by FSM. After such review and subject to FSM's input, the team will produce the final report on its findings and recommendations which will also be available on the PIF website and presented to the Forum during its 2013 annual Members meeting. The briefing was also attended by the President's Cabinet members, staff from the embassies, and other national government staff. Details of the team's findings as presented at the briefing will be released after official documents are received and accepted by the FSM Government. Kosrae, FSM, 22 November 2012 - “Our island, our life, our responsibility”, stands out on the signboard outside the shed at the Kosrae state port housing a project which has put the smallest state of the Federated States of Micronesia on the global sustainable development map. The Kutkut Mwo Materials Recovery Facility is also a good example of a project funded by an external agency, the United Nations Development Programme (UNDP), handed over to the Kosrae state government, and then leased out to a foreign investor, the Micronesia Eco Corp. The FSM Forum Compact Peer Review stumbled across the project when they visited Kosrae to consult with the state government from 16 – 20 November. Maria Gazia Fanelli, a member of the Kosrae Chamber of Commerce is from Italy. She came to Kosrae five years ago on a scuba diving trip but since then stayed on as she found the man of her dreams, Richard Mark Stephens, who runs the Micronesia Eco Divers. The couple now also operate the Pacific Treelodge Resort and the Bully Restaurant in Lelu, Kosrae. Maria is very compassionate about the environment. She seized the opportunity when the Kutkut Mwo Materials Recovery Facility was put out on tender by the Kosrae state government. She now runs the recycling business under the Micronesia Eco Corp. The Kosrae state government imposes a deposit fee on the importation of aluminium soft drink cans, plastic containers, bottled drinks and car batteries. The deposit fee collected on these items is put aside to fund the recycling of the items. Every month, the Micronesia Eco Corp goes around the communities on Kosrae to collect the trash and pay the communities for it. In 2011 the Recycling Facility paid US$85,000 into the community. The year before that the Facility collected 45.6 thousand cubic feet of trash materials and paid US$86,000 into the community. The trash are taken to the project site at a shed in the Kosrae port area where the cans and plastic containers are flattened and exported together with the discarded car batteries to Korea, China or Hong Kong. When you are next in Kosrae visit the Bully Restaurant next to the Pacific Treelodge Resort and you will find that you are walking on a glass aggregated concrete walkway to the Restaurant built among the mangrove trees. “This project contributes strongly to the sustainable development of the island (Kosrae) with its positive economic, sociological and ecological effects,” Maria proudly told members of the FSM Forum Compact Peer Review team when they visited the site of the project. According to Maria, trash collected in Kosrae in one year could fill up to 20 houses. The Kosrae Recycling Facility has won global recognition after it was among more than 800 environmental projects from 105 nations selected as one of three nominees for the Energy Globe Award in the category Earth, the world award for sustainability, in 2010. Maria has now taken to the schools on Kosrae to educate the new generation in the state about the benefits of recycling trash. The Facility is now looking at crashing the hundreds of rusting vehicles occupying the limited land in the state and exporting it for recycling. The sky seems to be the limit for this Italian lady that has found her paradise in the northern Pacific. The Kutkut Mwo Materials Recovery Facility in Kosrae is a clear example of how an eternally funded project requested by a Forum island country is given back to the government who in turn outsources its operation to the private sector for the benefit of the community. It’s a win-win situation for the funding agency, the government, the people, the environment and the private sector. FSM Information Services (November 23, 2012): President Manny Mori has called for enhanced leadership attention toward the College of Micronesia-FSM to ensure the college’s long-term sustainability amid external pressures from changes in Pell Grant eligibility, reductions in Compact scholarship funds and scaling down in Education Sector Grant (ESG) pursuant to resolution 2011-2 from the Joint Economic Management Committee (JEMCO), which oversees the management and accountability of all Compact funds. “The recent changes in Pell grant eligibility and reduction in compact scholarship funds are affecting the students’ ability to pay for their higher education. In addition, JEMCO had passed resolution 2011-2, which reduces Education Sector Grant (ESG) funding for the COM-FSM by $2,800,000 over the next four years starting with a reduction of $700,000 in FY2012. These are substantial impacts to COM-FSM and most especially, to our student”, the President expressed in his November 15 letter to Speaker Figir. “In light of these impacts, it is in the best interest of the Nation to safeguard COM-FSM from losing its accreditation and at the same time, develop and implement long term sustainability of these programs through local revenue”, he further stated. The college needs to garner leadership commitment from the nation’s policy makers to demonstrate to the Accrediting Commission for Community and Junior Colleges the existence of sustainable long-term financial basis to carry out its academic and related programs without compromising accreditation standards. The FSM National Government has allocated $700,000 in FY13 budget toward the college to fill the gap in the college’s funds for that year created by the JEMCO ESG reduction. According to the College of Micronesia-FSM, the elimination of the Year Round Pell Grant and the reduction in maximum number of semesters have impacted enrollment at the college. For Summer 2011, the change resulted in a 40 percent reduction in enrollment. As well, the reduction in the number of funded semesters from 18 to 12 made 66 enrolled BA and Fourth Year Certificate students needing other means of financial support. Additionally, the formula for Pell Grant eligibility for institutions will be moving away from enrollment numbers to a weighted average of completion rates, persistence rates, and other measures of student and institutional performance. The current level of college readiness of students could have a serious impact on the college. Given these circumstances, President Mori has asked the national leadership to step up support by means of funding increase and sustained commitment. Marz Akapito, markapito@gmail.com or fsmpio@mail.fm. Kosrae, FSM, 20 November 2012 - The state of Kosrae in the Federated States of Micronesia appreciates inclusion in the Cairns Compact on Strengthening Development Coordination (Forum Compact) Peer Review process currently underway in the FSM. The FSM peer review continues the series of peer reviews across the Pacific as part of a review of Forum island countries’ national development planning, budgeting, public financial and aid management processes and systems. FSM is the 9th Forum Island Country to undertake this process. FSM has also specifically requested that in recognition of the pressing challenges facing the country, the Peer Review Team should also consider the suitability of the existing policy environment for promoting private sector development. The FSM Peer Review Team consists of Mr Catolina Kijiner from the Government of the Republic of the Marshall Islands, Ms Noumea Simi representing the Government of Samoa, Mr Johnson Naviti of the Vanuatu Government and Mr Asif Chida from the UNDP Pacific Centre in Fiji. The team is assisted by staff of the Pacific Islands Forum Secretariat. After consultation with the national government at the capital Palikir, the Peer Review team divided into two groups to visit the four states. One group is visiting Yap and Chuuk and the other group covering Kosrae and Pohnpei states. At his meeting with peer review team members on 16 November, Kosrae state Governor, Hon. Lyndon Jackson, accompanied by the Acting Speaker of the Kosrae State Legislature, Mr Palikun Shrew and the Chairman of the Ways and Means Committee, Mr Bob Skilling commended the peer review for including the FSM states in its consultations. “We appreciate the extension of the peer review consultation to the states to enable the team to consider the relationship that exists between the four states and the national government of FSM,” said Governor Jackson. The peer review team members briefed the Kosrae state leaders on changes that were taking place elsewhere in the Pacific in respect of planning, budgeting and aid management, particularly in small countries such as Nauru, Kiribati and Niue which have hosted peer reviews. They underlined that the key to attracting development assistance that matches a country’s needs is the capacity to set a clear direction for development and implement it with the resources available now; and to understand development partner systems and motivations and develop strategic aid relationships. Kosrae Governor Jackson informed the peer review team that his government was the first state in FSM to pass the necessary legislation for tax reforms and has established an ODA unit to find other development partners who will be willing to assist in the economic development of his state leading up to 2023. Governor Jackson also acknowledged the important role that the private state plays in the economic development of Kosrae and his government’s dialogue with the state’s Chamber of Commerce through their inclusion in important government coordinated meetings. At a separate meeting on 17 November with members of the Kosrae Chamber of Commerce, Chamber President Witson Phillip confirmed to the peer review team the dialogue his members have with the state government. “The Kosrae state government invites us to the State Leadership meetings and the Chamber has used these opportunities to advocate the interest of it’s members,” said Mr Phillip. With a population of about 5,000 people, Kosrae, a 109 square kilometre island, is the smallest of the four states of FSM. It is the only state without any outer islands. Tofol is the capital of Kosrae state. 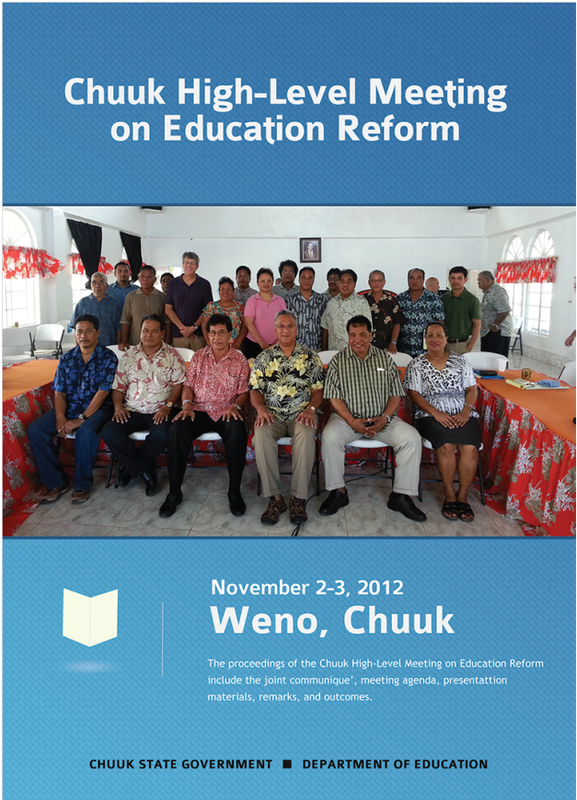 A high-level meeting on the future of education for Chuuk State was held in Weno, Chuuk, Federated States of Micronesia from November 2-3, 2012. Participating members included representatives of the three principal parties: the Chuuk State Government, the FSM National Government, and the United States of America. Observing the meeting were representatives of the five regions of Chuuk State, from the Mid-continent Research for Education and Learning (McREL), and the Pacific Resources for Education and Learning (PREL). The meeting was initiated by the Chairman of the Joint Economic Management Committee (JEMCO), Mr. Nikolao Pula, who expressed concern regarding that Committee’s disappointment and frustration with the lack of progress on education reforms in Chuuk State. Chairman Pula therefore requested a meeting in which he would join the President of the Federate States of Micronesia, H.E. Emanuel Mori, in Chuuk with the collective leadership of Chuuk State to achieve consensus and accelerate sensible reforms to improve educational outcomes for the children of Chuuk State. The structure of the meeting included presentations by the four key stakeholders within Chuuk State. First, The Governor, the Hon. Johnson Elimo, presented several strong commitments and proposed an Advisory Group mechanism to monitor progress on behalf of the principal parties. Second, the Legislature, represented by Speaker of the House of Representatives, the Hon. Innocente Oneisom, and by the Floor Leader of the House of Senate, the Hon. Alonso Cholymay, reported on their recent actions to pass a Department of Education Reorganization bill and a bill to transfer personnel management to the Department of Education. Third, the Chairman of the Chuuk Board of Education, Johannes Berdon, presented the reform actions completed by the Board and the reform actions they will complete going forward, as well as the Board’s newly adopted commitment statement to guide their work. Fourth, the Chuuk Department of Education was represented by three officials: Executive Director, Gardenia Aisek; Chief of Curriculum and Instruction, Johndy Nakamura; and Chief of Secondary Schools, Bersita Elimo. Their presentations also focused on reform actions completed and reform actions they will complete going forward, as well as a summary of the encouraging results of the Chuuk High School pilot program. The department’s presentation was augmented by a presentation on a community involvement initiative, "Adopt a School," given by the President of the Chuuk Women’s Council, Christina Stinnett. A ten-point synthesis of the reform commitments of the Chuuk State Leadership was presented by Rev. Arthur Leger, SJ. That presentation, entitled "The Way Forward: Specific Program of Action for Chuuk State Education Reform," is attached hereto and forms a part of this communique’. Throughout the meeting, there was an active and open dialogue among the principals and gathered observers, leading to greater clarity and understanding of the events that necessitated the High Level Meeting, and to greater clarity on the reform commitments being made by the Chuuk State Leadership. Both the FSM National Government and the United States government delegation provided support and encouragement. Specifically, the JEMCO Chairman committed to recommend to his colleagues favorable consideration of full funding of the FY2013 Education Sector Grant for Chuuk State, as well as favorable consideration for a special project-based proposal to fund non-recurrent reform implementation expenses. The Chairman did note that the grant will embed references to the commitments put forward by the Chuuk State Leadership to timely implementation of their specific program of action. The meeting ended on a positive note, including the commitment by the Governor of Chuuk State to ensure that reform progress would indeed be among his administration’s highest priorities, and would be featured in the State’s presentation at the planned mid-year JEMCO meeting, which the Governor also offered to host in Chuuk State, as a show of the confidence gained through the preparation for and the dialogue during this High Level Meeting. Assign existing consultant to Faichuk High School for 2013-2014 school year. Include CDOE management team and recruited consultants, completed by end FY2013 Q2. Through regional service centers, advance beyond educational reform awareness to educational reform engagement and ownership. 10. Organize and Implement Advisory Group Identify and confirm members no later than FY2013 Q2. 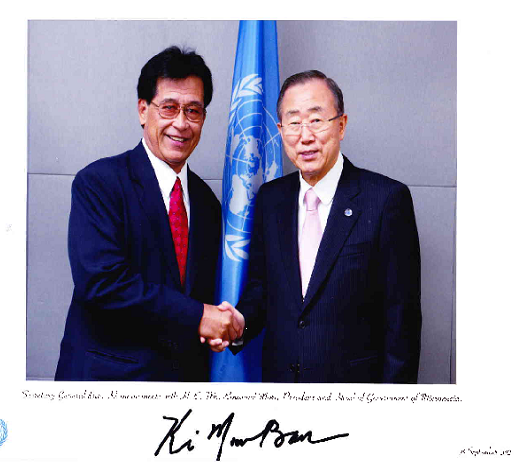 FSM President Manny Mori with United Nations Secretary-General Ban Ki-moon during the UN General Assembly, NY -- September 26, 2012. FSM Information Services (November 19, 2012): President Manny Mori has urged his cabinet members to consider the proposed agenda for the upcoming 18th Micronesia Chief Executives Summit in the Republic of the Marshall Islands and contribute to its finalization. As a practice, officials from jurisdictions to the Summit gather days ahead of the Chief Executives to finalize their recommended discussion focus and draft a communiqué for their review and adoption. “All Cabinet members who could best advice on the issues included in the agenda are urged to go”, the President wrote in a November 16 memorandum. The 18th MCES will take place on November 29-30, 2012.
tuna at its annual meeting from 2-6 December in Manila, Philippines. (such as controls on Fish Aggregating Devices or FADs). management measures this year at WCPFC." The above article was received from Anouk Ride. FSM Public Information Office is posting it here word by word as FSM is a major party in the PNA. All credits given to Anouk Ride, the originator. President Mori has begun a trip to Papua New Guinea (PNG) to attend a special convening of Pacific Leaders. As a decision that came out of the Pacific African, Caribbean and Pacific (ACP) meeting the end of August, 2012 in Rarotonga, it was agreed that PNG would host this special gathering to address PACP matters relating to ongoing negotiations with the European Union. At the ACP meeting in Rarotonga, Leaders decided to defer matters regarding to Fiji's participation at Pacific ACP meetings to the upcoming PNG-hosted gathering. As the meetings in Rarotonga were primarily set for the Pacific Islands Forum, Fiji did not attend per temporary exclusion from PIF affairs until the government recommits to parliamentary democracy. Additionally, Pacific Leaders also directed the Secretariat of the Pacific Community (SPC) and the University of the South Pacific (USP) to present an analysis on sound options for submarine cable connectivity for Pacific Islands at the meeting. President Mori will return on or about November 24. Marz Akapito at markapito@gmail.com or fsmpio@mail.fm. On November 7, President Manny Mori submitted a request of $600,000 to Congress to fund FSM's matching share for the $3.2 million cost of implementing the Tax Reform IT Program over a five year period. The requested amount is to cover FSM's share in the next two years. Total FSM share is $999,000. "The Tax Reform Project has requested funding assistance from AusAID and it is expected that AusAID will be able to provide $2.26 million with the remaining $999,000 to come from matching funds provided by the FSM Government", the President said in his November 7 letter to Speaker Isaac V. Figir. Additional information provided to Congress indicated that Data Torque of New Zealand has undertaken some scoping work for the project and will be the company to conduct further work, including the installation of the system-wide IT network and capacity building for agents at the FSM Unified Revenue Authority. Data Torque is a Wellington-based New Zealand IT company that has grown in service experience since started in 1994. As of print time, the writer is not certained on how far the request has gone with Congress. Wandering by Congress Chamber: "What's up with MiCare?" Yesterday, I wandered by the FSM Congress Chamber and noticed that there was meeting. I dropped in. Apart from the Congress staff and two from Executive Branch, I could count the observers at the session on one hand. There were only 11 Congressmen present out of 14. When I got in, they were already on "miscellaneous matters" part of their agenda -- meaning, they were about to finish the meeting. When I took up a seat at the back, I noticed that the Senators were talking about the MiCare Health Insurance -- (Health Care Plan for the FSM). It seemed they had been talking quite a bit about it already. I heard the Speaker (Hon. Isaac V. Figir) advising the Chairman of the Committee on Health and Social Affairs (Senator Otto), that he (Speaker) would like for the committee to conduct public hearings on MiCare in all the States. The Chairman said he would do so after his meeting with committee Members this session. The meeting concluded not much after I turned up. I don't know what else the Senators talked about; the staff didn't bother giving me an agenda sheet as the meeting was already winding down, I guess. Having said all these, it could also be possible that Congress was talking of something else but I totally failed to comprehend since I came in late. Watching their meetings is always fun! I hope more FSMers make it a priority to follow along with their meetings -- for all kinds of good reasons. Click on the link right below to read the submitted proposed changes to the MiCare law. Marz Akapito -- markapito@gmail.com or fsmpio@mail.fm. FSM Information Services (November 16, 2012): The FSM Department of Health and Social Affairs has disseminated public notices regarding scheduled sessions for influenza vaccinations on December 3 through December 6, 2012. For the first two days, vaccinations will be conducted at the FSM National Government compound in Palikir from 10a.m. to 2p.m. On the 5th and 6th, the same activity will be held at the Spanish Wall in Kolonia. The public is encouraged to take advantage of the activity for needed protection against "the dreadful flu". For more information, call the department at 320-2619/2643/2872. Published November 16, 2012 -- by the Pacific Periscope Newsletter, a weekly publication for Pacific Islands Trade and Investment. Australia’s first global ambassador for women and girls, Penny Williams, has outlined the challenges and solutions, opportunities and options for women entrepreneurs and leaders of the Pacific during her address at the opening of the Pacific Women in Business conference in Nadi, Fiji, this week. The Pacific Islands Private Sector Organisation (PIPSO) hosted ‘Pacific Women in Business Conference 2012’ brought together Government and community representatives to discuss and make practical recommendations on how to progress the development of women entrepreneurs. More than 100 women from 14 Pacific countries participated in the meet. The conference challenged the world to harness women’s many talents in powering economic development. Ms Williams said women must ensure they were given access to capital so that women entrepreneurs could turn their ideas into small and medium enterprises. “When women participate more fully in their economies, everyone benefits. Conversely, across the world, economies are suffering because of women’s limited access to employment opportunities,” Ms Williams said. The International Labour Organisation (ILO) estimates that in the Asia-Pacific region alone this equates to a loss of $47 billion annually, she added. She advocated improving women’s access to markets and said there was also a need to examine and reform legal and regulatory systems so women could avail themselves of the full range of financial services. Also included in the conference are disabled women who are involved in business as well as the Pacific Disability Forum. President Mori, left, and Ambassador Heidorn of Germany during the presentation of credentials for the Ambassador at the President's Conference Room on November 13, 2012. FSM Information Services (November 15, 2012): In the morning of November 13, President Manny Mori received H.E. Joachim Heidorn as the Ambassador Extraordinary and Plenipotentiary of the Federal Republic of Germany to the Federated States of Micronesia, replacing H.E. Weber-Loch whose service officially ended in September, 2011. President Manny Mori welcomed Ambassador Heidorn to Pohnpei and conveyed his greetings to President Joachim Gauck through the Ambassador. President Mori acknowledged the good relations between his country and Germany and expressed interest in enhancing more bilateral as well as multilateral engagements. The President also expressed gratitude for the assistance extended to the FSM through Germany’s Small Scale Project Scheme in certain areas that include Agriculture and food production, Historic Preservation, Climate Change and Diplomatic Training. After presenting his credentials to President Mori, Ambassador Heidorn expressed his gratitude to the President for accepting him. “Germany and its partners in the European Union have a strong interest in further enhancing co-operation and dialogue with their partners in Asia and in promoting our common values of democracy, rule of law, respect for human rights, political stability, and market economy and free world trade as well as the preservation of our natural resources”, said Ambassador Gauck. The Ambassador also said, “A top priority for our government remains the task to mitigate the effects of global climate change”. Ambassador Heidorn is cross-accredited out of Manila, representing his country at the same time in the Republic of Palau and the Republic of the Marshall Islands. Germany and FSM formally established diplomatic ties in April 1992. For more information, call the FSM Department of Foreign Affairs at 320-2641 or write to fsmpio@mail.fm. Since becoming a Post Forum Dialogue Partner in 1990, China has maintained cooperative relations with the Pacific Islands Forum and this commitment was further aided today in its cash donation of US$250,000 of which will fund the Pacific Islands Trades & Invest office in Beijing. The remaining US$400,000 will go towards the China – PIFS Development Cooperation Fund. Mr Slade acknowledged the Forum’s shared vision with China in achieving sustainable economic growth in Forum Island Countries in the context of the Pacific Plan which addresses significantly, regional integration and cooperation. 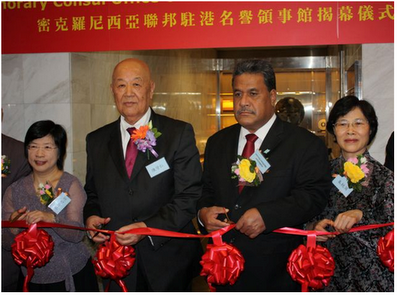 The Chinese Government’s on-going commitment to PIFS both financially and politically in the past 12 months, notably includes China’s agreement to the name change of the Forum’s Beijing office from the Pacific Islands Forum Trade Office to Pacific Trade and Invest, as well as supporting the placement of a new Pacific Island staff member in office. China continues to provide support through scholarships it offers under the China – PIFS Regional Scholarship Programme. A total of 10 scholarships were provided in 2011, to students from Fiji, Samoa, Kiribati and Solomon Islands. The SG further noted that the growing public interest in the scholarship programme was an indication of the importance of the relationship established between the Forum and China in terms of development. In his closing remarks, the SG extended an invitation to China to participate in stakeholder consultations towards the refreshed process of the Pacific Aid for Trade Strategy, and the efforts to establish a Pacific Regional Trade and Development Facility for the benefit of communities across the Pacific region. Pohnpei, FSM, 15/11/12- The President of the Federated States of Micronesia, H.E Emanuel Mori has welcomed the peer review of FSM and urged the peer review team to be frank but also fair and accurate in its assessment of the country’s processes and systems. The FSM Peer Review Team consists of Mr Catolina Kijiner from the Government of the Republic of the Marshall Islands, Ms Noumea Simi representing the Government of Samoa, Mr Johnson Naviti of the Vanuatu Government and Mr Asif Chida from the UNDP Pacific Centre in Fiji. The FSM peer review continues the series of peer reviews across the Pacific as part of the Cairns Compact on Strengthening Development Coordination (Forum Compact) to review FIC’s national development planning, budgeting, public financial and aid management processes and systems. FSM is the 9th Forum Island Country to undertake this process. In a meeting with the peer review team on 14 November in Palikir, Pohnpei, President Mori urged the peer review team to take into consideration the special circumstances of FSM having a loose federation with three layers of government operating in the four semi autonomous states and a national government. With funding under the Compact of Free Association with the United States expected to end in 2023 the Government of FSM is now discussing policies that will enable the country to fill the gap that will be left in its budget. H.E Mori explained that some of the measures his Government has been pursuing include encouraging more investment in the FSM Trust Fund, increasing revenue including introducing tax reforms, scaling back on government expenditure and developing the private sector. “There is a need to enable investment in the FSM both domestic and foreign direct investment,” President Mori said. “There a lot of opportunities available to us. We just need to work out our internal arrangements. The development partners are behind us. We the people of FSM need to decide whether to continue to have the easy life of eating from the shops or we develop ourselves,” said Mr Mori. The Government is establishing a 2023 Taskforce to provide recommendations to policy makers on how to address the expected fiscal challenges in the next 10 years and beyond. The Peer Review Team, which is in the FSM from 12 – 28 November 2012, will hold consultations with representatives of government departments, non-government organizations, the private sector and the development partners. The Team will also consult with the states of Pohnpei, Chuuk, Kosrae and Yap. At the end of the consultations, the Team will produce a report that will include recommendations for the FSM Government and its development partners. The report will only be released after it has been endorsed by the Government of FSM.